If you’re in the market for an affordable gaming chair, chances are you have clicked through dozens of different models by now and quickly became overwhelmed (don’t worry; making this review was a little overwhelming for us at first too). Luckily, we’re here to help. There are several questions you should be asking yourself before making a purchase: How many hours do you play on a daily basis? How much do you rely on your gaming chair for support and comfort? Do you also use this chair for work? Once you have a good idea how much you will be using your chair, you’ll be able to better pinpoint what features you might need (if you’re uncertain, check out the guide at the bottom of the article). With the help of this guide, you can finally stop looking and start gaming – comfortably – once again. 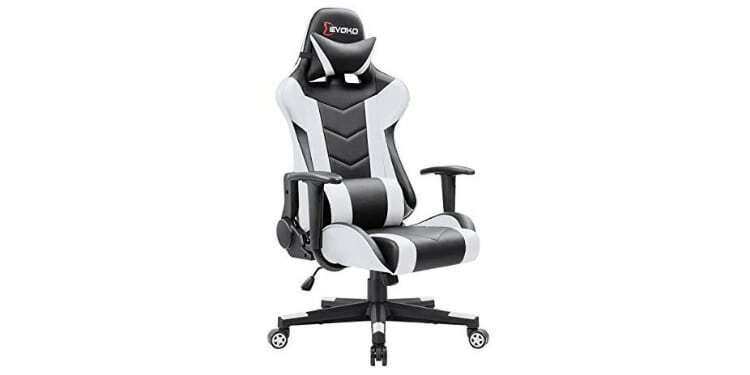 The Devoko Racing Style Gaming Chair comes in at the top of our list as one of the best gaming chairs under $200 dollars. This chair is pretty straightforward, featuring three hundred and sixty-degree rotation and the ability to lock your wheels in place, this chair enables you to either move freely or stay in one place with ease. In terms of comfort, the Devoko has several adjustments: a tilt lock in case you need to stretch out a little bit in between games; an ergonomic headrest for neck support (it’s removable though if you don’t have a neck); adjustable armrests for individualized forearm support; and an adjustable lumbar cushion to encourage good posture. As far as material goes, this chair is made of PU leather that is stitched in a diamond pattern for extra durability. Devoko offers a thirty-day warranty if you are not satisfied with the chair, and an additional six-month warranty is added for free replacement parts. If you’re looking for a simple gaming chair that still has all the added features, Devoko has you covered. Homall’s ergonomic high-back gaming chair is designed with a tight budget in mind. It doesn’t have any crazy features atypical of a budget gaming chair, but in this price range dependable mediocrity isn’t a bad thing, per se. That’s especially true since this is the best priced gaming chair on this list. 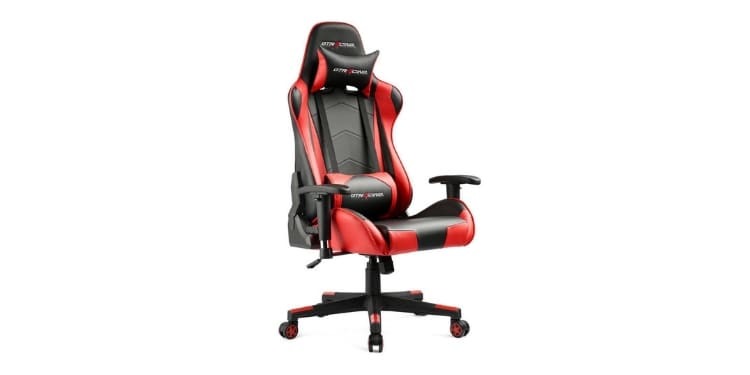 That being said, it does have a few features that helps it find its own niche: a footrest, adjustable armrests (which can be hard to find at times), a long back that gives additional support for your neck and shoulders-- making this a solid choice for taller gamers-- and auto-locking castors. The castors are weight activated, providing optimum movement while seated. Once you stand up the braking mechanism activates and holds the position in place, ensuring the safety of the player and the chair itself. Once you sit back down the castors will unlock and move freely once again. This is the feature we liked most about the chair. Reclining the chair is simple – the back of the chair can be adjusted to any body weight by leaning back, finding the perfect position, and locking it into place. The chair also sports adjustable lumbar support, and the footrest is customizable as well. The Elecwish Ergonomic Gaming Chair has a sleek and simple appearance, available in 8 different colors (orange, blue, gray, green, red, etc). The chair is not so flashy that it’s distracting, but still has enough color to separate it out from boring, single color chairs; unless you like boring single color chairs in which case you can get this in all black. This chair is also wider than the average gaming chair. The seat is thick and designed for all body shapes and sizes, skinny or husky. In order to provide additional comfort, the chair can recline 170 degrees as well as lock into place in various positions. The chair is equipped with an SGS airlift, providing a three-inch height adjustment. The chair is made of a super dense sponge wrapped in PU leather. The base of the chair is foldable with anti-scratch coasters to keep any wooden floors safe from dents and scratches. This chair also has noteworthy arm rests, for both good and bad reasons. At first glance, they’re really nice looking and have a larger cushioned area than most. But, they don’t have any adjustments (although they do dynamically slide backwards when you recline the chair). Moreover, it’s very common that at least one of the two armrests is loose or wobbly. 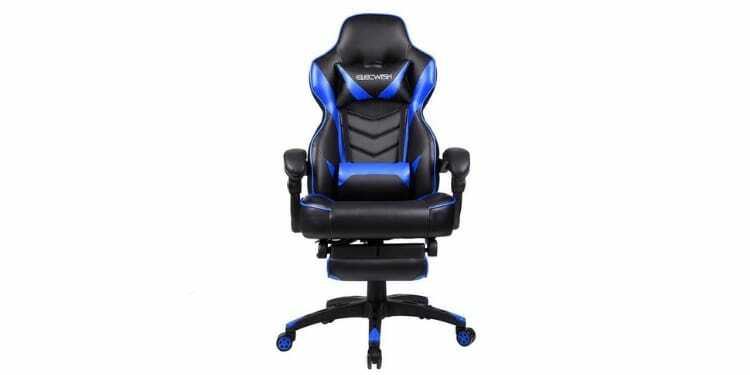 The Elecwish Ergonomic Gaming Chair is one of the more comfortable chairs for larger gamers but designed for anyone who likes to spend hours online. 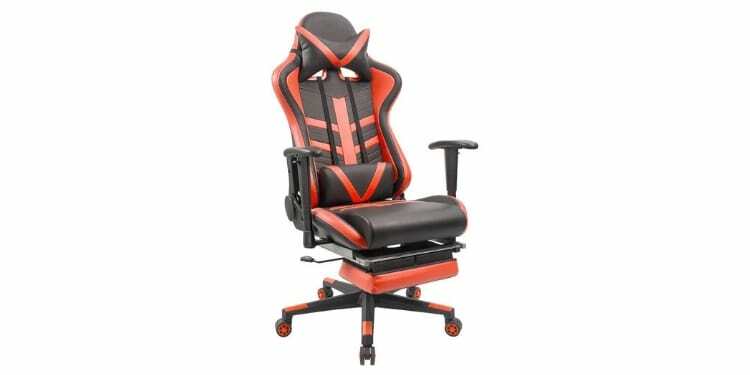 Throw in the removable headrest, lumbar support, and retractable footrest and you have yourself one of the best PC gaming chairs under 200 dollars. The Merax High-back Racing Chair’s adjustment system allows for a complete three hundred and sixty-degree swivel, back tilt functionality, and lets you lock the chair in its upright position. In fact, this chair has a respectable amount of adjustability thanks to its height and armrests. Of course, that’s not even mentioning that the backrest can be positioned and locked into place at degrees ranging from ninety to one hundred and seventy degrees, making it great for a quick nap if need be. Merax offers a two-year warranty for any issues you have with their product. All of this is packed into an eye-catching, racing influenced aesthetic that doesn't disappoint. While this chair is only available in 3 colors-- green, red, and ice blue-- that wouldn’t be a problem if it wasn’t for the fact that some colors are more expensive or outright unavailable at times; a problem that is common on this list, frankly. This Furmax High-Back Gaming Chair has all you need for a pleasant and comfortable gaming experience, all built within a cool racing-influenced design. PU leather upholstery, thick padding, and ergonomic technology ensure a comfortable fit for any body type. 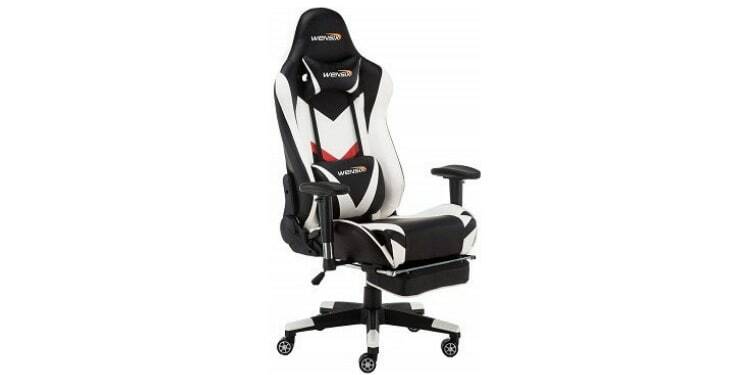 Moreover, this gaming chair has soft lift armrests which provide cushy support as you play. The steel frame and nylon base combine to create a sturdy support system to hold fast, even at the three hundred pound maximum weight capacity. The sturdy base is also designed to stay steady when the chair is reclined in any position. The pneumatic lift system adjusts smoothly with a pull of a handle, making for easy height adjustment to best suit your body type. Furmax is a respected name in the gaming world, and this chair is a testament as to why that is the case. With all the features you need, this chair is ready for your next gaming season. GTRacing has dedicated much of their time and effort to designing gaming chairs that are stylish and comfortable enough for professional gamers, and this model is no exception. 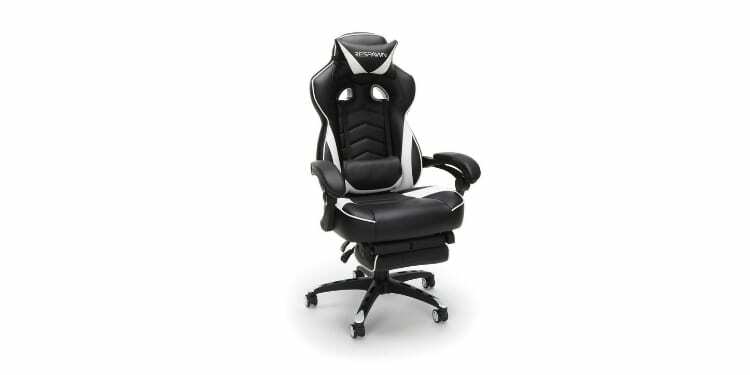 Ergonomically designed with a strong metal frame and a thick padded seat, this chair is ready for hours of comfortable gaming. The armrests are adjustable-- both up and down as well as pivoting-- to keep your arms supported. It also has height adjustment, which is simple to use. The reclining and rocking features allow you to lock the backrest into place in either an upright or reclined position, depending on your mood. Smooth PU leather covers the chair, making for a comfortable experience. Moreover, the seat, lumbar, and headrest cushions offer additional support. This GTRacing Gaming chair is one of the best gaming chairs for the price. Not only does it boast professional style, but also all of the features needed for long, yet comfortable gaming sessions. This gaming chair is a worthy addition to your gaming setup. The Respawn 110 racing style gaming chair is designed for intense gaming and tedious office work. Super dense padding wrapped in bonded leather makes for a comfortable and professional looking chair. Although built to last through years of wear and tear, this chair comes with a lifetime limited warranty through Respawn. The chair also has an adjustable headrest, providing optimal neck support. 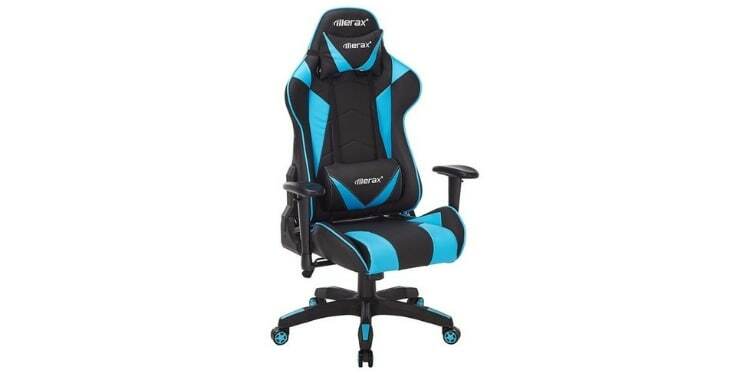 This chair’s adjustable lumbar support helps keep your posture straight to prevent stiffness while putting in long hours on the computer. The armrests have extra padding that pivots along with the reclining of the chair for added forearm support. These 4D armrests can ensure a fitting position for any gamer at any time. Interestingly, these look nearly identical to the Elecwish’s distinct arm rests. Interestingly, these also share the Elecwish armrest’s propensity to feel loose. Of course, the height of the chair is adjustable, and it can recline from ninety to one hundred and thirty degrees. This chair goes beyond industry standards, as it is one of the most innovative and comfy gaming chairs on the market today. The chair is customizable and adjustable in several ways. Featuring a three hundred and sixty-degree swivel and a sturdy, five-point base with locking casters, movement is a breeze. 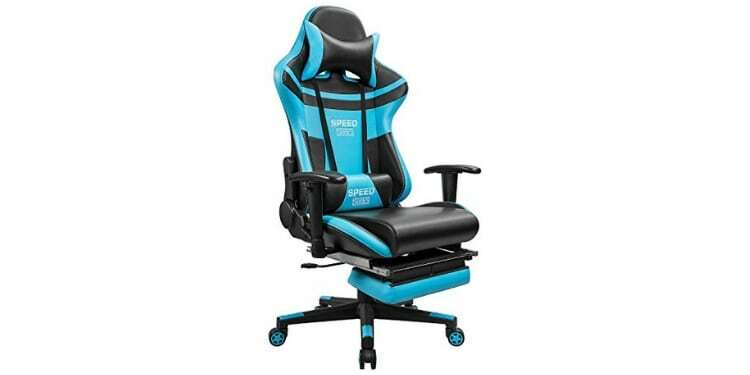 The seat and backrest are wider to accommodate larger gamers who need a little extra width to be comfortable. The armrests are simple and small, but supportive. The headrest pillow and lumbar cushion are removable for a little extra room if need be. A small footrest can be retracted as well for relaxing during downtime. This chair even features a rechargeable massager that works out any knots you may have from sitting for an extended period of time. This also has some of the nicer color options on the list; in fact, some of them are tri-color, which adds a nice extra touch of detail. For a budget PC gaming chair under 200 dollars, this one cannot be topped. Class 4 life piston for height adjustment. The Deerhunter High Back Gaming Chair is a solid choice. I know… that’s not a glowing endorsement. But this isn’t a special chair per se, it’s just a solid chair. And like I said earlier, that’s fine in this price range. It’s a little on the smaller side. While it should be fine for your average guy-- 6 feet 200lbs-- it might be a little snug for those that are larger. This extends to the neck and lumbar supports which are both a little smaller, but still comfortable nonetheless. The cushioning also isn’t anything to write home about. It works well for short to mid-length play sessions, but longer session might force you to stretch your legs some. The back can adjust and lock into multiple positions within the range of ninety to one hundred and seventy degrees. 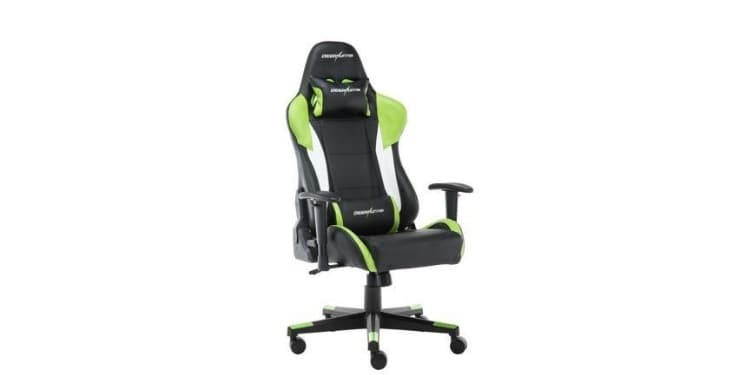 The headrest is adjustable for desirable neck support, and the armrests are padded and adjust as well for added support if you need to change positions. It is worth noting that the different “color options” on Amazon are actually different chairs; specifically, out of the 5 options, there are actually 2 different chairs. The two oddly named colors-- 8006bue and Eoos-red-- are actually their Siv-RE chairs while the other three colors-- red, blue, and green-- are their Ares_YE. Although this chair’s price tag is less than $200, it still has a sleek, comfortable design. The racing-inspired design shape is perfect for back and neck support and, combined with a stylish aesthetic, this chair is sure to please. Oh, and it also has one of the larger lumbar supports on this list. The chair reclines a full one hundred and eighty degrees if you need to stretch out or relax in between games. The height of the chair can be adjusted using the level 4 gas cylinder mechanism. Most impressive of all, the chair’s armrests adjust in every dimension, so you can tweak the chair to perfection. It’s hard to find a cheap comfortable gaming chair, so let’s discuss what you need to consider when browsing. You will be spending hours in this chair almost every day, so you need to be sure you get the perfect seat that fits not only your style but your body type as well. Our body is built for activity, designed to be mobile and flexible. When we sit in one place for hours on end we tend to go against nature’s intentions. It is important to keep a good posture while gaming and having a chair that supports this idea – and your back – is very important for your spinal health. Having bad posture can lead to shortened gaming sessions as well. You wouldn’t want to be in the middle of a great gaming session, only to stop halfway through because you’re having back and neck pains! lor sit amet, consectetur adipiscing elit. Ut elit tellus, luctus nec ullamcorper mattis, pulvinar dapibus leo. Rocking Gaming Chair – These chairs rest on the floor in an L shape. The bottom of the chair is rounded to provide a little bit of movement or rocking. Many of these styles come equipped with speakers built into the headrest. These are more common for console gaming and are frequently seen at Wal-Marts. Pedestal Gaming Chairs – These chairs are basically Rocking Gaming chairs… placed on a pedestal. While this adds some height and swivel motion, it also completely nullifies the need for the L-shaped design. 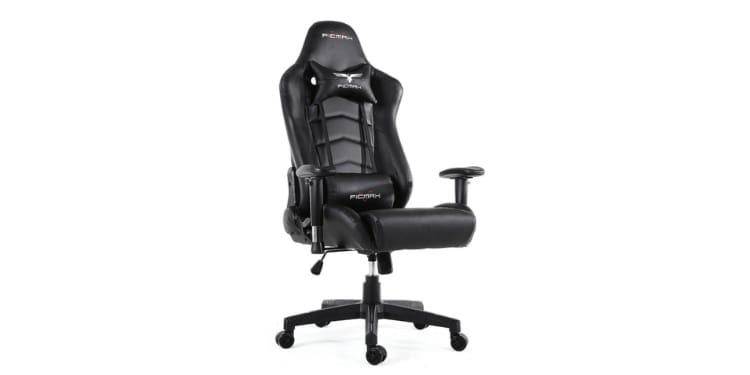 Racer Gaming Chairs – Racing chairs are designed for racing games, at least originally. Not unlike many PC gaming chairs, Racer style chairs are designed to be similar to bucket seats in racing cars. Many of these chairs come equipped with a steering wheel and pedals to create a very immersive experience when playing racing games. PC Gaming Chairs – PC gaming chairs are the stars of our article and are the most versatile when it comes to gaming. These are familiar since they are identical to standard office chairs for the most part barring mostly aesthetic differences. Past choosing the style of chair you are interested in, there are still several things to consider. You’ve probably seen this word quite a bit in your search for the perfect chair. “Ergonomic” means it is designed for easy and comfortable use by humans. There are ergonomic guitars, keyboards, and of course, chairs. An ergonomic gaming chair– that is, a chair designed to properly accommodate the human body– will work wonders when it comes to comfort and spine health. For instance, a traditional dining room chair has a lot of hard 90-degree angles, which is at odds with the human form. When companies design and manufacture chairs specifically for gaming, they are building them knowing that their users will be seated for hours on end. These designs often include many adjustable components, removable headrests, and lumbar cushions. When you’re in the market for the best PC gaming chair, you are looking for the best for you. Just because the reviews are perfect for a chair doesn’t mean it’s perfect for you. All the different shapes and sizes of the human body make this difficult for chair manufacturers– this is where adjustable features come into play. Below we mention some of the more common adjustable parts and how you might expect to adjust them. As mentioned above, headrests and lumbar support are features of an ergonomic design. Along with these features we have armrests and footrests as well. In order to purchase the most versatile and customizable chair, be sure to have all four of these components on your new chair. The more adjustable the better. Headrests often adjust up and down or are removable. They need to be quite firm for support of sensitive muscles in the neck and upper back. Lumbar cushions tend to adjustable by a lever or are completely removable due to straps. They are typically very dense with little give. These are handy to keep your posture in check and add support to the lower back. Adjustable armrests are harder to come by, but they do exist and they’re very important. Usually, these features are adjustable up and down, side to side, or even pivot in some cases. Footrests aren’t as common as the above features, which are nearly mandatory even in this price range. You’ll want your footrest to be easily retractable– which is rare– and for it to be sturdy. If you don’t care about a footrest, then that’s fine since most can be removed (or just never put onto the chair to begin with since you have to put it together). Misc. You should also consider height adjustment, seat recline, backrest size, etc. All of these factors – depending on how well they suit your body type – will either make or break your experience. It’s important to note that it is really hard to find a chair that is great in all of these categories whether in this price range or in the premium tier. When it comes to gaming chair materials, there are two popular choices: leather-like or mesh-like fabric. While these materials each have their own perks, the choice is ultimately up to you and your personal preferences. Most of the more popular brands use polyurethane (PU) leather materials since they are smooth and durable. Either stitched or bonded together, the leather is reliable for a long term gaming chair that is going to be used daily. While leather chairs look more professional and may be more durable, they tend to be less breathable than fabric or mesh chairs. Fabric chairs are much less common with popular gaming chair brands, but they offer their own perks. These chairs tend to be much more breathable than leather, so if sweat is an issue, consider a mesh design. You might have better luck finding a fabric chair by looking at traditional office chairs, but even those quickly become dominated by leathers at higher price points. The style and appearance of your chair should be a small factor in your decision… that being said, we both know no one wants to have an ugly chair. Luckily, it’s possible to have both. Most PC gaming chairs are designed after bucket seats in race cars, as this look is the go-to for both ergonomics and looks. While at a glance most chairs seem the same, the contours and little details say a lot about your style. Are you a serious person using the chair for gaming and work, or perhaps an all-out flashy type of person who needs a bright vibrant color scheme? Further still, maybe you just want it to match your room. Either way, there’s going to be a chair for you, so choose colors that suit you. The price of your chair doesn’t have to break the bank. Many brands offer a wide price range to suit their customer’s different budgets. Just because something is more expensive doesn’t mean it’s better. Choose wisely and within your means so you can have plenty of cash for the new games or PC gaming hardware you need. On the other hand, it’s important to invest in a quality gaming chair that is comfortable and, more importantly, will last a long time. If you’re going to be gaming for hours every day (or close to it) you need a chair that’s fit for the task.